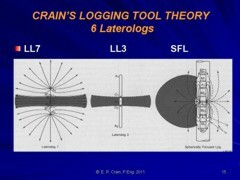 Publication History: This article is based on Chapter 3 of "The Log Analysis Handbook" by E. R. Crain, P.Eng., published by Pennwell Books 1986 Republished as "Crain's Logging Tool Theory" in 2004 and updated annually through 2016. Major update Dec 2018. This webpage version is the copyrighted intellectual property of the author. The laterolog was put into service in 1949, predating the induction log by 6 or 7 years, as a replacement for the ES Log in salt mud environments. It was another invention by Henry Doll of Schlumberger. Competitive tool designs were called Guard Logs or Focused Logs. The objective was to focus the current from the tool into the rock better than could be accomplished with the ES Log. Tool designs evolved significantly over the years and modern tools are in widespread use in both salt and fresh mud environments. The laterolog is a direct current (DC) tool based on Ohm's Law. The tools have been designed to produce reliable resistivity measurements in boreholes containing highly saline drilling fluids and/or when surrounded by highly resistive rocks. The logging current is prevented from flowing up and down within the drilling fluid by placing focusing electrodes (A1 and A2) on both sides of a central measure electrode A0, as illustrated below. The focusing electrodes force measure current to flow only in the lateral direction, perpendicular to the axis of the logging device. Schematic diagrams of laterolog 7 (left), laterolog 3 or Guard log (middle) and spherically focused log (right). Grey shading represents desired current path. The Laterolog 7 electrode arrangements can be likened to two ES logs spliced together, with one tool upside down. The center current electrode A0 is in the middle of the current path. Guard electrodes A1 and A2 keep the current focused. On the LL7, measure electrode pairs M1 and M2 straddle the top and bottom current path boundary. The secret is to keep the current flow constant to get an accurate resistivity. CAUTION: Older laterologs had unusual resistivity scales. Some were linear with multiple backups, eg 0-100, 0-1000, 0-10000. Others used a hybrid scale that managed to compress resistivity from zero to infinity into a single track with no backups. Look at the Example to see how it was done. Logarithmic scales appeared for the dual laterolog and later tools to eliminate these problems. A backup scale is still possible. Note too that the SP was recorded 40+/- feet off depth and that part of the log was sliced off and spliced back "on depth", if someone remembered to do the task. Since the tools were run mostly in salt mud and SP is not much use in salt mud, not a lot of attention was paid to this problem. I tried to fix this in 1964 using the GR memorizer panel. It worked on the bench but not at the wellsite due to stray ground currents. There are two major types of laterologs: three electrode guard systems and multiple electrode systems. Guard systems utilize two elongated focusing (guard) electrodes (A1 and A2 and a small center measure electrode A0. Zero potential difference is maintained between the center and guard electrodes during logging. Resistivity is proportional to the potential (voltage) on the center electrode, as shown mathematically later in this Section. Seven electrode systems have an additional two pairs of small electrodes placed symmetrically on both sides of the center electrode (M1 – M1’ and M2 – M2’). The zero potential difference is maintained between these additional electrodes. Seven electrode systems include the obsolete LL7 style tool. Bed resolution of the above tools is 3 feet, considerably better than the 64 inch Normal and most induction logs (except the array induction). In all guard systems, the zero potential difference between the center electrode and the guard electrodes prevents current emanating from the center electrode from flowing along the borehole even when it contains highly saline mud. Thus, the measure current will assume the shape of a cylindrical disc. A Canadian company, Roke Oil Enterprises Ltd, developed a laterolog in the 1970's so stable that it could keep a zero potential difference even in cased holes, allowing the measurement of resistivity through casing. Thirty years later, the majors produced their own through-casing resistivity tools. The thickness of this current disc is approximately equal to the length of the center electrode plus one-half the distances separating it from each of the guard electrodes. The path taken by the measure current of a laterolog constitutes a series circuit through the drilling mud, mud cake, flushed and invaded zones, and the undisturbed formation. In a series circuit, the total resistivity is the sum of resistivities along the current path. The pseudo-geometrical factor concept was developed to estimate the influence of these zones on the measured apparent resistivities, in a manner similar to that described earlier for the induction log. Both borehole and bed thickness correction charts are available in service company chartbooks, based on computer models of the pseudo-geometrical factors for each tool design. Dual laterolog tools use 9 electrodes. Additional A1’ and A2’ electrodes provide greater guard electrode coverage than a single upper and lower guard. Different depths of investigation are created by controlling the potential on the outermost guard electrodes. Shaded area at the right shows desired current paths. The two depths of investigation are recorded alternately so that the currents do not interfere with each other, but quickly enough that both look like continuous logs. An early version of this tool was called a sequential dual laterolog; here a switch could be set while the tool was downhole to select one or the other electrode set, but it took two passes over the logged interval to obtain both logs. The two curves were called "shallow" and "deep" by the service companies, but from a depth of investigation point of view, they were treated as "medium" and "deep", although not as deep as a dual induction log in its fresh mud environment. If a shallow resistivity was required, an MSFL or MLLC log was run as a separate pass into the hole. The Laterolog 8, with 8 electrodes, was designed to replace the 16 inch normal on the induction log when it was re-introduced as the dual induction log. It had better bed resolution and less borehole effect, and survived in saltier muds than its predecessor. It was replaced after a few years by the spherically focused log, which is 9 electrode system, but the electrodes are arranged to place the guards closer to the center electrode, and the equalizing electrodes further away. Its response was believed to give a better impression of the shallow resistivity in the flushed zone (Rxo). Newer laterologs are called high resolution laterolog and azimuthal resistivity log, replacing those described above. The high resolution tool has 5 depths of investigation, similar to the array induction log presentation. Typical bed resolution is 2 feet, and the high resolution curve can resolve 8 inch beds. The azimuthal tool records resistivity in 8 directions radially around the wellbore. In a vertical well, this may not have great impact, although the image can show bed boundaries, dip angle and direction, and fractures very well. Composite deep and shallow resistivities are recorded. In a horizontal well, it has serious uses. Looking up, the tool might see the cap rock (low resistivity for shale, high resistivity for anhydrite). Looking down, the tool might see low resistivity for water or high resistivity for more pay. Sideways, the tool should be looking at the pay zone. The 8 azimuthal resistivities can be presented as an image log, similar in appearance to a resistivity microscanner image. It has coarse vertical and horizontal resolution compared to the microscanner, but is considerably cheaper to run. Cased hole formation resistivity logs make direct, deep reading resistivity measurements through casing and cement. The concept of measuring resistivity through casing is not new, but recent breakthroughs in downhole electronics and electrode design have made these challenging measurements possible. Now the same basic measurements can be compared for open and cased holes. The effects of invasion are usually dissipated by the time the log is run, so the measurement is considered to be a good representation of true resistivity, as long as cement conditions are adequate. The tool injects current into the casing with sidewall contact electrodes, where it flows both upward and downward before returning to the surface along a path similar to that employed by open hole laterolog tools. Most of the current remains in the casing, but a very small portion escapes to the formation. Electrodes on the tool measure the potential difference created by the leaked current, which is proportional to the formation conductivity. Typical formation resistivity values are about 10^9 times the resistivity value of the steel casing. The measurement current escaping to the formation causes a voltage drop in the casing segment. Because the resistance of casing is a few tens of microohms and the leaked current is typically on the order of a few milliamperes, the potential difference measured by the CHFR-tool is in nanovolts. Like all other logs, laterologs have come in many flavours and styles over the years. Below are examples of older logs that you will find in well files from earlier times. Sample Laterologs, with gamma ray, showing hybrid resistivity scale (left) and logarithmic scale (right) over same wellbore interval. Many varieties of Laterolog are run today, some with a dozen or more resistivity curves. The hybrid scale was run from 1950 into the 1970's. It is composed of a linear resistivity scale running from 0.0 on the left to 50 or 100 ohm-m in the middle of the track. From the middle of the track to the right hand margin, the curve is actually a linear conductivity scaled from 20 to 0 or 10 to 0 milli-mhos. These two scales are equivalent to a 50 to infinity or 100 to infinity resistivity scales. These combined curves give the hybrid scale a continuous resistivity range from 0 to infinity across one or two tracks. The conductivity curve was also presented on some logs. The hybrid scale was replaced by the logarithmic scale in the 1970's, which may have backup scales because of the high range of resistivity that can be measured with this tool. The SP curve may be present, but it may be pretty flat because laterologs were usually run in salt mud. The SP track may be shifted by splicing the film, as the curve was recorded 28 feet off-depth on some tools. Newer logs usually have a gamma ray curve in Track 1 instead of the SP. Azimuthal resistivity image logs (a form of laterolog) and high resolution laterologs can be displayed as images as well as resistivity curves. 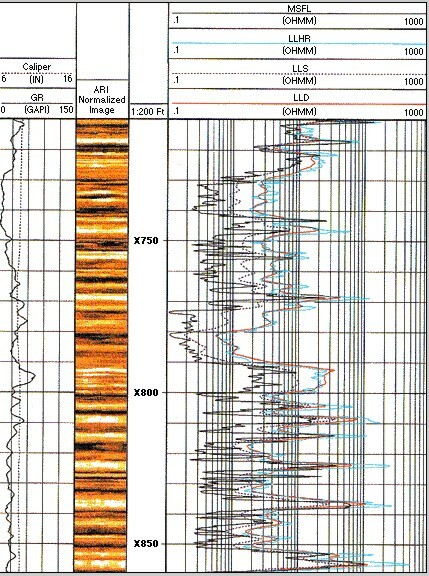 Below is a sample of an array induction (AIT) log and an azimuthal resistivity (AIR) log, the latter showing the azimuthal image log presentation. Comparison of array induction log (left) and azimuthal resistivity laterolog (right). Curve complement and presentations vary considerable with age and contractor. The image log on the azimuthal resistivity presentation is "poor man's" resistivity microscanner log, giving a reasonable sand count regional dip, and some fracture information. A real microscanner image is shown for comparison (left image). about 8 inches. This tool is not azimuthal so image shows flat-lying beds even when dip is present.